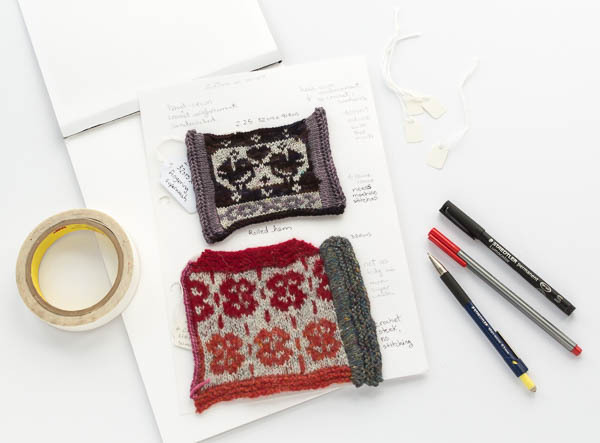 I taught my Fair Isle class at Loop, on the weekend, and was asked to share my method for archiving my knit and design reference samples. I started doing this in college for textile technology classes. We had binders full of fabric swatches and fibre samples, where we identified the characteristics and completed burn tests. The teacher swore we would refer to them in years to come. I didn’t really believe her because my brain was still young and fresh. My party trick, at the time, was to touch any item of clothing and tell the wearer exactly what the fibre content was. I can’t do this anymore, partly because there are so many new fibres and processes that I’m not familiar with, and partly because I just can’t remember as much. The teacher was right. Now, of course, we have the internet for looking up the difference between a Twill and an Oxford weave, but it’s not quite the same as touching a sample, looking at it through a magnifying glass, or burning it. Sadly, I lost those reference binders in trans-continental moves. I wish I still had them. I have developed similar methods for cataloguing my knit and sewing reference samples. These have been useful for teaching, learning new techniques and designing. Heavyweight Cartridge paper, A4, 200gms. I buy these in pads from Cass Art. The heavy weight of the paper supports the samples. Binders and box binders. I like the order of binders but the spring clips always die, so I mostly use box binders now. Wash, block and finish as for finished garment. On the tag: write the yarn, needle size, gauge and name of stitch or chart, if used. This is attached to the swatch and stays with it, even if I pull it off its mount. I like to know which needle size I have used for all my swatches. Stick double sided tape to cartridge paper and mount sample. I then write any notes on the cartridge. Often I have treated the sample in different ways on different edges. Mounting them allows me to draw arrows to the specific things I have tried out. The samples, in the picture above, have been steeked and there are different edge treatments. I can easily pull them off and look at both sides of the sample and then stick them back down again. 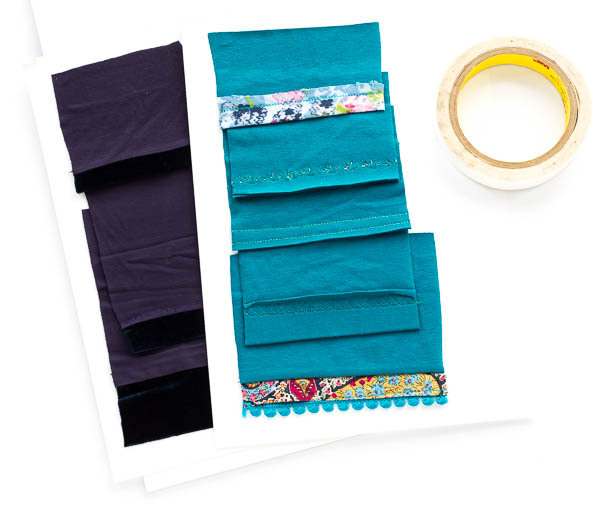 Stick copies of stitch instructions or graphs next to the swatch. If I am working on a design project, I will draw ideas that might work with the swatch, on facing pages. 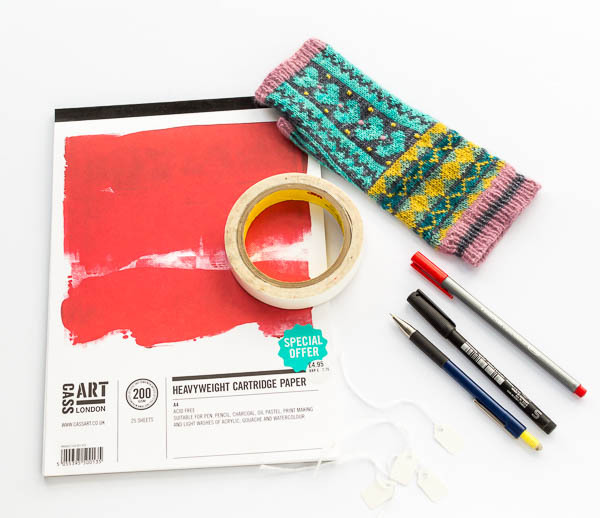 I wrote an article about my design process for Pom Pom Quarterly. I have specific binders for various techniques. I have a binder for stranded knitting, lace knitting, short rows, cast-on and bind-offs and binders or boxes for specific design projects. Steekers: practice your steeking on swatches of different yarns. Try your sewing machine and crochet steeking. When I begin a sewing project with a new fabric type, or a technique that I am less familiar with, I make and mount sewing samples. After I have cut my project from the fabric, I use the scraps to make some test samples. Again, in college, we had binders of sewing samples like plackets, fly-fronts, collars. These would be executed in muslin (calico for my UK friends) and a contrast colour thread. They had to be perfect! 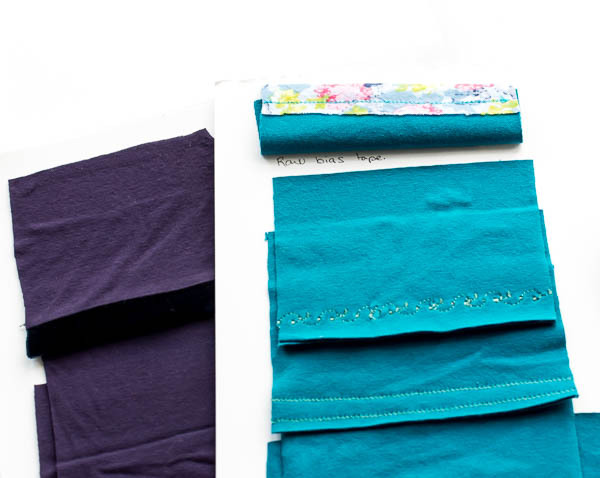 In the above samples, I was playing with different (unconventional) methods of binding or finishing jersey fabric edges. I have a box binder filled with jersey samples. Sometimes the differences, in the samples, are subtle like trying out different interfacings. I make notes and keep them with the samples, these ones are concealed under the edge of each sample. Those are my archiving methods. Does anyone else do this or have other techniques to share regarding swatch management? Throw everything in a bin promising oneself that you’ll label and organize later. End up with mangled ball of unidentifiable potential cat toys… Think I prefer your disciplined process!